To encourage each child to be kind to others. Prayerfully study Luke 10:25–37 and John 13:34–35, 15:12. See also Matthew 22:36–40 and Gospel Principles (31110), chapter 30. Prepare to sing or say the words to “Jesus Said Love Everyone” (Children’s Songbook, p. 61). The words to this song are included at the back of the manual. Cutout 2-1, wounded man; cutout 2-2, priest; cutout 2-3, Levite; cutout 2-4, Samaritan. Follow up with the children if you encouraged them to do something during the week. You may want to have them tell about ways they shared during the week. Show the children the map of the Holy Land found at the end of the lesson. If the children are not familiar with maps, explain that a map is a drawing of an area such as a country or city. People use maps to tell them how to get from one place to another. Point out some of the features of the map, such as the land, the sea, and the rivers. Explain that this map shows the Holy Land, where Jesus Christ lived when he was on the earth. Point out Judea. Explain that the people who lived in this part of the Holy Land were called Jews. Point out Samaria. Explain that the people who lived in Samaria were called Samaritans. Explain that during Jesus’ time the Jews and Samaritans did not understand or like each other. The Jews felt they were better than the Samaritans. Jews would not eat in the home of a Samaritan or eat food prepared by Samaritans. The Jews disliked the Samaritans so much that if they had to travel to Galilee (point out Galilee) they would go all the way around Samaria even though it was shorter to go through Samaria. Show how much farther it would be to go around Samaria than through it to get to Galilee. Explain that when Jesus Christ was on the earth, he often told stories to help people understand his teachings. One of the stories he told was about a Samaritan. Tell the story of the Good Samaritan, as found in Luke 10:30–37. Invite a few children to help you by holding up the cutouts at the appropriate times. 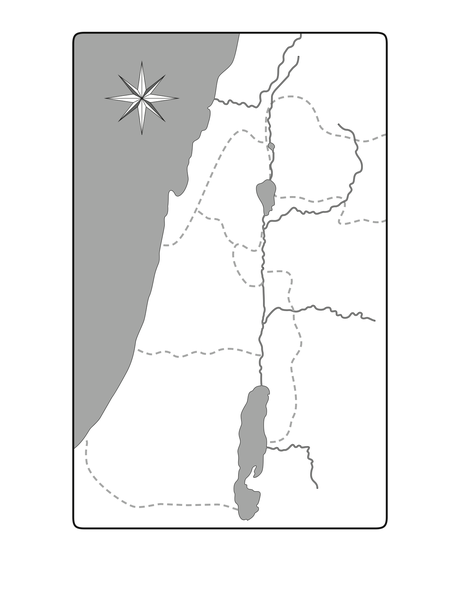 The wounded man was traveling from Jerusalem to Jericho (point out the two cities on the map). The first man who passed by without stopping to help was a Jewish priest. Priests worked in the temple and were thought to be righteous and holy men. The second man who passed by without helping was a Levite. Levites also worked in the temple and were important in the Jewish religion. The third man was a Samaritan. He stopped to help the wounded man. Explain that because this Samaritan man was so kind, he is called the Good Samaritan. Have the children return the cutouts to you. Have one child lie on the floor or sit in a chair, pretending to be injured. You and the other children pretend to be traveling on the road to Jericho. Have the children follow you and do as you do. First pretend to be the priest walking along the road. Start walking around the room. Suddenly you see someone lying by the side of the road. He is badly hurt. Cross over to the other side of the road, indicating that you will not help the wounded man. Then pretend you are the Levite. Walk around the room. You see someone lying beside the road. His clothes have been stolen, and he is badly hurt. What did the Levite do? Stop and look at the injured person. Then go on with your journey without helping him. Now pretend you are the Samaritan. Walk around the room. You see someone who is badly hurt lying by the side of the road. What did the Samaritan do? Act out the kind actions of the Samaritan. (If your class is large, you may want to assign children to pantomime different acts of service.) Pretend to clean the man’s wounds, put him on a donkey, take him to an inn, and promise to pay the innkeeper for anything else the man needs. Tell the children that now that they have taken care of the injured man, they are to return to their seats. Then they are to sit down and put their hands quietly in their laps. Which man did what the Savior would want him to do? Explain that after Jesus told this story, he said we should do as the Good Samaritan did and be kind to everyone. Explain that being kind to everyone isn’t always easy, especially if someone makes us feel bad or treats us unkindly. In your own words, tell the following story about a girl who learned a great lesson when another child treated her unkindly. Ask the children to listen for her solution to her problem. Luisa and Todd were friends and enjoyed playing together. One afternoon, however, they got into an argument. Luisa called Todd a name, and Todd pushed Luisa down. When she began to cry, he made a face at her. What would you do if you were Luisa? Luisa went to find her father. She knew that he would help her. Luisa told her father how Todd had pushed her down and had been mean to her. She asked her father to go outside and punish Todd. Luisa’s father told her that punishing Todd might not be the best thing to do. He told Luisa to go into the kitchen instead and spread some jam on two pieces of bread. Then he told her to take one of the pieces of bread to Todd. If she did that, Luisa’s father said, she would have a friend instead of an enemy. What did Luisa want to do after Todd pushed her? What is our first reaction when someone is unkind to us? What happened when Luisa was kind to Todd? What would have happened if Luisa had not been kind to Todd? Remind the children that Jesus wants us to be kind even if others are not kind to us. Show the Bible and read aloud John 15:12. Explain that these are Jesus Christ’s words. He commanded us to love one another. When we are kind to each other, we are showing our love. Sing or say the words to “Jesus Said Love Everyone” with the children. Explain that this song can remind us to be kind and do what Jesus would have us do. As you are walking down the street, you see that someone has had a bicycle accident. As you get closer, you see that it is a boy who is always teasing you. His pant leg is caught in the chain of his bicycle. He cannot move without help. What could you do to be kind to the boy? You have planned a special party for your birthday next week, and you want to invite all the children in your neighborhood except one. She is new in the neighborhood. She never smiles and isn’t much fun to play with. What could you do to be kind to this girl? While playing with your friends you fell down. One of your friends called you clumsy and laughed at you. Now your friend has fallen down and is crying. What could you do to be kind to your friend? A boy in your class at school uses braces to help him walk. When all the children go out to play, he gets left behind because he walks slowly. He often sits by himself, watching everyone else play ball. What could you do to be kind to this boy? What have we learned in today’s lesson? When we show kindness, whose example are we following? Read aloud John 13:34–35. Explain to the children that when we love others and are kind to them, we show that we are disciples (followers) of Jesus Christ. Testify to the children that Jesus wants us to show love for others by being kind. Remind the children that we should be kind to everyone, even to those who do not always treat us kindly. Bear your testimony about the importance of following Jesus by choosing to be kind. Encourage the children to make a special effort to be kind to others during the coming week. Remind them to think of the words to the song “Jesus Said Love Everyone” when they need to remember how to treat someone. Ask them to notice what happens when they choose to be kind. Suggest that they come ready to tell about their experiences next week. Give the children paper and crayons or pencils and let them draw pictures of ways they can show love for others by being kind. Label each child’s picture with the words I can be kind to others. Help the children sing or say the words to “Kindness Begins with Me” (Children’s Songbook, p. 145). Help the children think of people they could be kind to (such as family members, friends, or classmates) and ways they could show kindness to these people. Help the children understand the importance of being kind to those who are not kind to us or who seem different from us. With the children, sing or say the words to “A Special Gift Is Kindness” (Children’s Songbook, p. 145). A special gift is kindness. After you sing or say the words to the song, tie a piece of string or yarn around each child’s finger or wrist. Explain to the children that the string is to remind them to be kind to everyone, and suggest that they wear the string or yarn for the rest of Primary.